Yesterday we touched on the Diggers and Dealers conference in Kalgoorlie, providing an overview of the commentary around base and precious metal commodity price movements in the lead up and during the week. Alongside those dynamics, investors appeared to view some companies as ripe for the picking. The five stocks below delivered the best share price performances based on their price at the start and the end of the week. Of course, potential investors should note that as with all minerals exploration, success is no guarantee. Consider your own personal circumstances before investing, and seek professional financial advice. The best share price performance came from Blackham Resources (ASX: BLK), a company that produced 39,400 ounces of gold in fiscal 2017 from its Matilda/Wiluna gold project. With a resource of 6.2 million ounces grading 3.1 grams per tonne, for large-scale gold systems and a landholding of more than 1000 square kilometres, investors see potential for resource expansion, multi-mine production and an increase in mine life beyond the three years implied by oxide reserves. Management highlighted that the initial expansion study confirmed its plan to grow production beyond 200,000 ounces per annum with the potential for a long mine life. This is just the scenario Diggers investors were looking for this time around; some earnings and cash flow visibility with production-driven upside potential. The location is also important as BLK’s assets are in Australia’s largest gold belt stretching from Norseman through Kalgoorlie to Wiluna, with a regional endowment of more than 40 million ounces. The following infographic demonstrates the numerous options available to the company. It also indicates that BLK will be a news driven story with exploration results from greenfield targets, potential share price momentum from studies and Resource increases, as well as an anticipated ramp up in production. Shares in Westgold Resources (ASX: WGX) surged 15 per cent in the course of the week, hitting a high of $1.72. However, this is still substantially shy of Bell Potter’s price target of $2.50. While WGX is much further progressed than BLK, the importance of not being reliant on one asset would have been an important additional attraction. Having a number of assets in production not only provides multiple revenue streams, it also offers some insulation against unforeseen problems that may occur with any project. For single mine operators this can decimate group earnings, but in the case of WGX its impact is diluted because earnings from other projects are maintained. WGX is well-endowed with a number of mines supported by established infrastructure that combine to generate substantial production of a strong resource base as outlined below. WGX has a prominent presence in both the Murchison and the Eastern Goldfields of Western Australia, as well as the Rover project situated in the Northern Territory. In the last year, the company produced circa 267,000 ounces of gold at All-in Sustaining Costs (AISC) of $1204 per ounce. While not as economical as some of its peers, this still left a reasonably healthy margin, having achieved an average sale price of $1640 per ounce. To a certain extent, WGX has been a growth by acquisition story, and this is likely to continue with management commenting at the conference that the Central Murchison Gold Projects (CMGP) were emerging as ‘the biggest aggregation play since the Super Pit’. On this basis, the company believes one of the most compelling investment qualities offered by WGX is its growth profile compared with most of its peers, as outlined below. Kin Mining (ASX: KIN) is an emerging WA-based company which is aiming to make the transition from explorer to producer by the second half of calendar year 2018. In the meantime, there will be substantial news flow which has the prospect of providing significant share price support. The company’s flagship asset is the Leonora Gold Project (LGP) located 35 kilometres north-east of the major regional mining centre of Leonora, a prolific gold-bearing region that features some prominent names and deposits. Those include Sons of Gwalia/St Barbara (ASX: SBM) (9 million ounces), Mt Morgans (3.3 million ounces) and Saracen’s (ASX: SAR) King of the Hills (2 million ounces). LGP is made up of three resource centres with a total resource inventory of 721,000 ounces. The most prominent is Mertondale (395,000 ounces), followed by Cardinia (192,000 ounces) and Raeside (134,000 ounces). 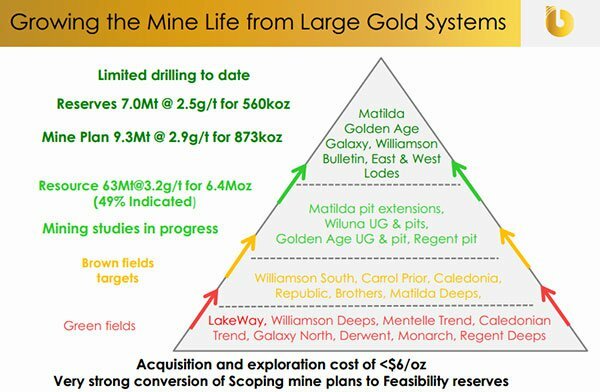 While Cardinia doesn’t have the largest resource, management sees it as ‘the LGP engine room’ with recent high grade primary gold discoveries within two long gold systems of more than 3 kilometres. At this stage, KIN is planning to build its processing plant in close proximity to the Cardinia deposit. The 100,000 ounce Bruno-Lewis system is located within the Cardinia deposit and management sees the development of Lewis as a potential game changer. Indeed, this is supported by extremely promising exploration results as indicated below. Running in tandem with the promising news from the Lewis high-grade discovery is the promising exploration results from Mertondale, which suggests there is the potential for significant resource growth. Management highlighted the fact that the deposit’s depth potential has largely been untested, and it will be looking to expand the open pit resource, particularly given other companies in the region have achieved robust production by extracting ore at depths below the relatively shallow zones targeted by KIN so far. 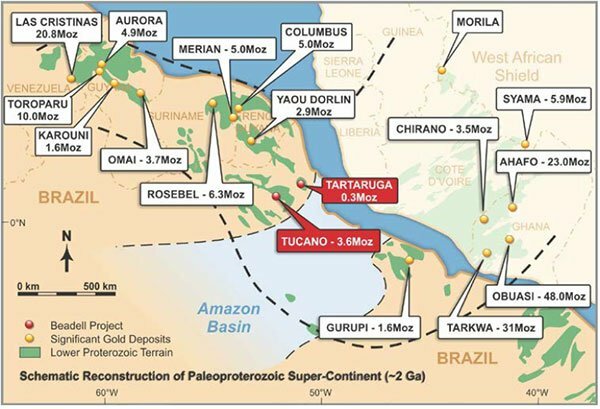 Beadell Resources operates the Tucano gold project in Brazil, situated in an underexplored Greenstone belt with an endowment of more than 60 million ounces. The company has full control of 2500 square kilometres, which has a current resource of 3.9 million ounces. Importantly, there is an under-drilled eight kilometre mine corridor, providing potential to substantially increase its resource. 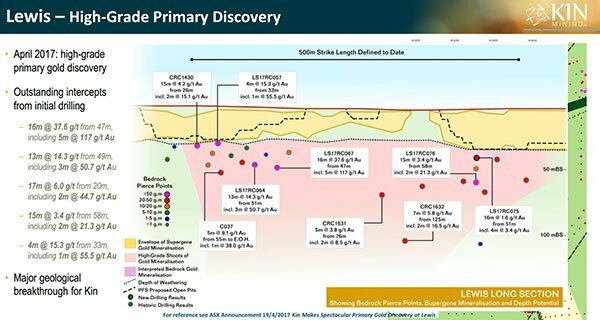 The property-wide drilling depth averages only 100 metres, providing the scope for resource expansion from deeper drilling where early exploration has already indicated the presence of high-grade mineralisation. However, the company faced a number of headwinds in fiscal 2017 which resulted in production and earnings falling short of most analysts’ expectations. As earnings forecasts were slashed the company’s share price was sold down, hitting a low of 18 cents in July after trading in the vicinity of 50 cents only 12 months earlier. Consequently, while those at Diggers and Dealers obviously liked the story, they may have determined that its shares were oversold – with all of the bad news hopefully factored in. Fundamentally, the company appears to have some merit, particularly based on fiscal 2018 forecasts. BDR reports on a calendar year basis, and while analysts at Citi recently downgraded forecasts, they still point to the company achieving a core net profit of $32.1 million in the 12 months to 31 December 2018, representing earnings per share of 2.7 cents. This places the company on a forward PE multiple of 8.3 relative to Friday’s close. Given Citi is forecasting profit to increase substantially from $32.1 million in fiscal 2018 to $55.3 million in 2019, it is likely that investors see the stock as relatively cheap. Management confirmed at the conference that they were expecting production to increase to more than 170,000 ounces over the next 12 months. Note that any news is speculative at this stage therefore investors considering this stock for their portfolio, should seek professional financial advice. 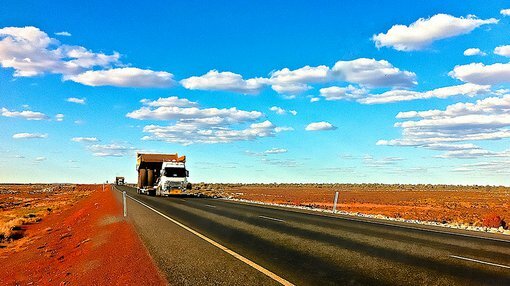 When examining Gascoyne Resources’ (ASX: GCY) share price rerating, it again could be argued that the key factor behind it was the extent of visibility investors had in forecasting the next 12 months. Doing so may have prompted them to take a stake in a budding low-cost/high margin circa 100,000 ounce per annum producer. The company has a sizeable resource of 1.3 million ounces with 623,000 ounces in the current mine plan, providing a potential six year mine life. The proved and probable reserve of 581,000 ounces assumes a gold price of US$1140 per ounce. The company is targeting significant prospects in close proximity to its flagship Dalgaranga project in the Murchison region of WA. Production is expected to ramp up to 120,000 ounces per annum over the next two years, not taking into account any resource expansion resulting from exploration success. A further enticement is a second project in Glenburgh, north of Dalgaranga, and has a resource of 1 million ounces. Management expects that development of this project has the potential to elevate GCY to a +200,000 ounces per annum producer. Another impressive aspect of the Dalgaranga project is its low All-in Sustaining Costs (AISC) of less than AUD$1000 per ounce, equating to a margin of more than $600 per ounce based on the current spot price. GCY’s share price has the potential to gain momentum through the remainder of 2017 and into 2018, on the basis of upcoming news flow from Dalgaranga. 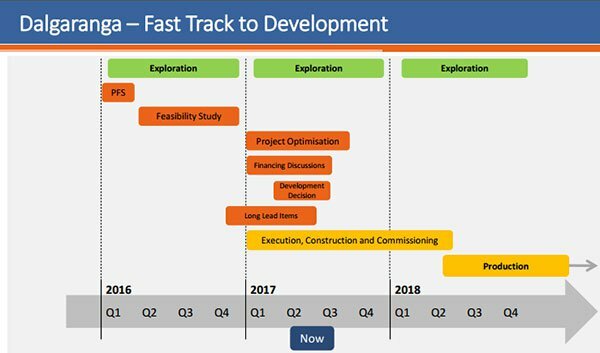 This is evident in the following timeline – which doesn’t even take into account developments with its other projects including the prospect of exploration success and resource expansion.